Size: Plate is 16.6 inches tall! This is an amazing plate of echinoderm fossils. 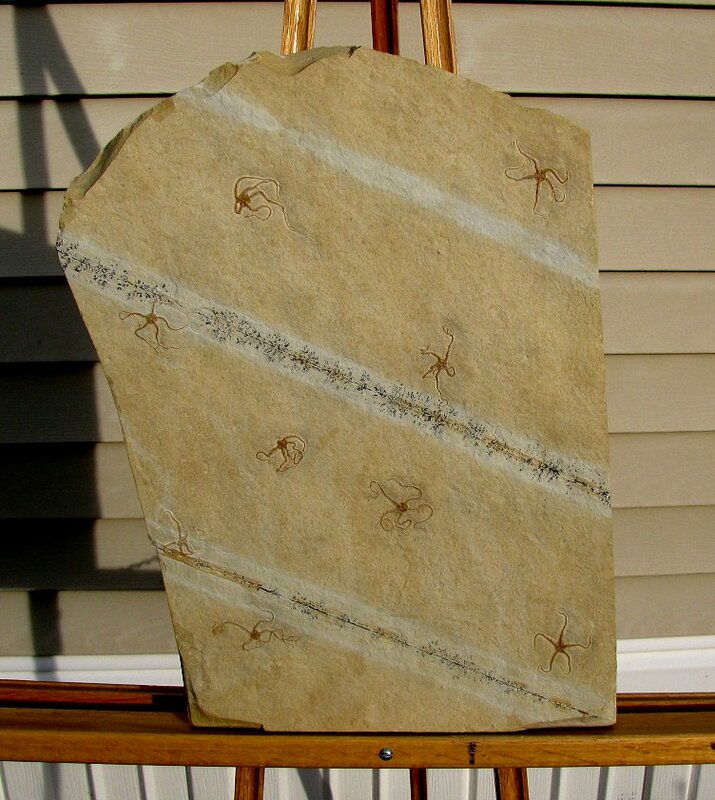 It is a HUGE plate of Ophiopetra brittlestars from the famous Solnhofen Limestone of Hienheim, Germany. This plate has NINE COMPLETE BRITTLESTARS preserved and well displayed. The Ophiopetra have a small central disc and LONG arms which are covered with large spines. All nine stars are complete with all five arms intact, which is extremely unusual. The fossils have excellent detail preserved, and there are even rows of dendrites present. The brittlestars are beutifully spaced on the large, UNBROKEN slab of lithographic limestone. This is an extremely collectible and displayable plate of spiny brittlestars from a closed European locality.